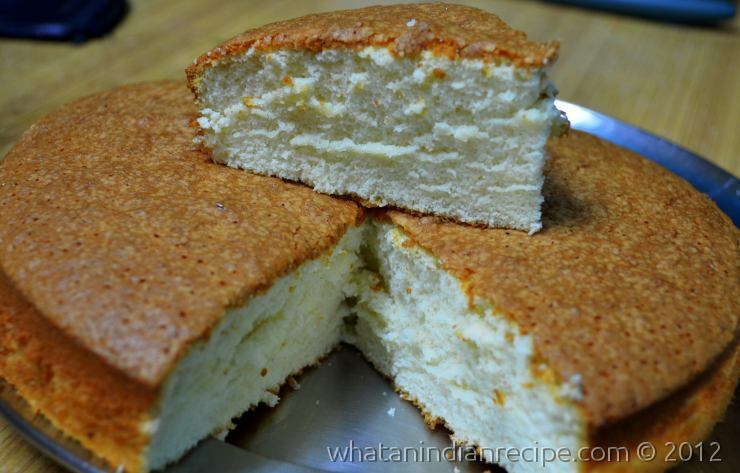 Sponge cake is super soft and melts in your mouth and it’s very easy to make, while the ingredients being very basic. Beat the eggs with the help of beater till fluffy. Now add the sugar and again beat for around 2-3 minutes. Mix half of the maida/flour and baking powder in a bowl and add this slowly to the egg mixture while beating continuously on medium speed. Boil the milk along with butter in a pan, till the butter melts, and add this milk-butter mix to the cake mix and beat again. Add vanilla essence to this mix and also the remaining flour mix slowly while beating continuously. Grease a cake mould of about 8″ with butter and then pour this mixture into it. Bake the cake at 160°C for 40-45 minutes . The cake is done when pushing a safety pin in the centre of the cake , comes out clean.